Empire Coin and Valuables, Confederate Money. 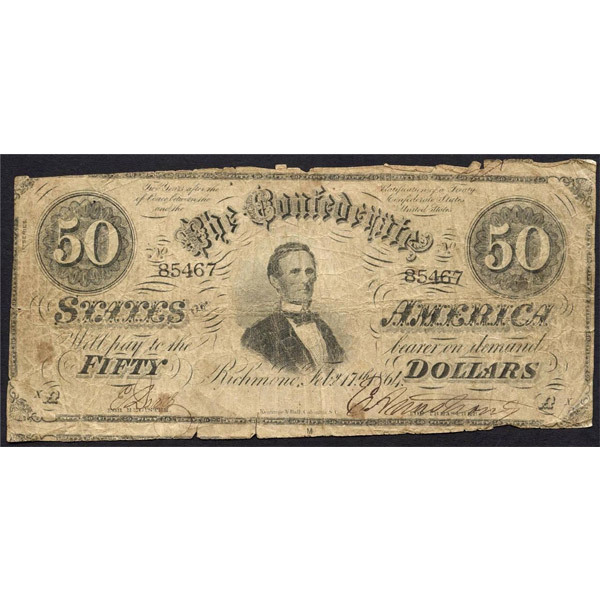 Confederate money was issued during the Civil War as a means to establish an independent economy from 1861 to 1864 with denominations varying between 0.50 and $1000. Whether having acquired these notes through generations of family, lucky finds in old furniture, or even purchasing them yourself owning a piece of a very historical time period can be exciting, not to mention potentially profitable. Unfortunately, a large percentage of confederate money that exists is counterfeit. Over the years, museums and historical sites legally reprinted millions of notes as souvenirs or educational purposes along with many more placed in cereal boxes as a marketing tool. Due to the old age of some of the replicas, they start to look legitimate, but if you know what to look for, detecting a counterfeit from an original can be easier then you think. During that time period, due to lack of significant funds, there were many cost cutting measures taken. The majority of Confederate notes were printed on cheaper rice paper, which has a very flimsy consistency in comparison to our modern currency. They also had to hand cut the notes using shears or scissors, so originals should not have perfectly cut edges. Each individual note was either handwritten or, less commonly, stamped with a serial number and signed by the treasurer in iron gall ink. Many forgers would use the same serial number over and over but lists of commonly used forged serial numbers have been complied over time and can easily be found on the internet. The iron gall ink is of a dark brown color and over time oxidizes, in most cases causing bleeding. Often times, on counterfeits, the serial number and the signatures are perfectly printed with modern ink, which would have no bleeding or fading whatsoever. A sure sign you have a reproduction is if you find any additional words on the note. The notes distributed by the cereal company will say “reprinted in 1954” while a number of the other souvenir pieces have the word “facsimile” (meaning copy) printed in small lettering on the back. Many might be as straightforward as having the word “copy” or “replica” printed somewhere on the note and although these seem like obvious examples, if you didn’t know what to look for you wouldn’t necessarily see them. All reproductions along with the modern forgeries have little to no monetary value which makes finding the real thing that much more exciting. Depending on the condition, year, and denomination of your confederate money you might be on your way to riches!